Grimmster will be working with Art in Effect Team developing new “enhanced” design services that will involve doing detailed interactive art work for the gaming, medical and enterprise infographic markets. We are excited about working with Grimmster, says Maurice Middendorf founder Mauruarend New Visions Art. “I just wanted to focus on doing great art work.” so the strategic partnership with grimmster works out well as they have been involved in development and search marketing for several years and really know and love the software side. 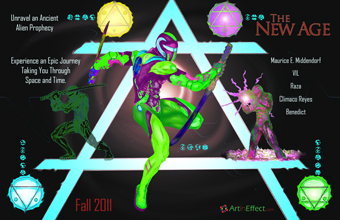 Art in Effect while working on several projects, including a graphic novel called The New Age, brings to the table years of experience and a design team that can handle very sophisticated projects. We will be attending several Comicon conferences this year as well as E3 Expo as we explore taking on more interesting and innovative projects. So be on the look out for some wild new designs. Grimmster, as part of our regular educational and development solutions has worked with many startups. If you have any innovative online development work or ideas, contact us and we can give you an what it will take to put it together.